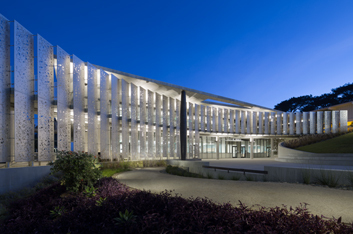 Point Loma Nazarene University’s new 36,000-square-foot science center was custom-built to accommodate their growing science program with additional lab and office space. This design-build project included a new science building holding 14 labs, one “clean room” and four new class rooms. Extra space was created where the current equipment is housed to allow for additional equipment in the future. Dynalectric’s scope involved site utility connections to the building for SDG&E, AT&T, COX and an OSP fiber optic backbone. Dynalectric installed all lighting, site lighting, Title 24 compliant lighting controls, power, natural gas engine generator, fire alarm, TeleData, CCTV, CATV Wi-Fi, security infrastructure and power cabling. Connections to all lab equipment, including fume hoods and exhaust systems were installed by our team. There was an extensive use of pre-fabricated isoducts at labs for power devices, specialty power devices and TeleData devices. With the help of Dynalectric’s in-house BIM capabilities, we were able to coordinate the layout of open ceiling labs and classrooms along with other interior spaces. Point Loma Nazarene University is a liberal arts college that focuses on academics, faith and community. The campus has over 3,500 students and offers more than 60 different undergraduate degrees and graduate studies.